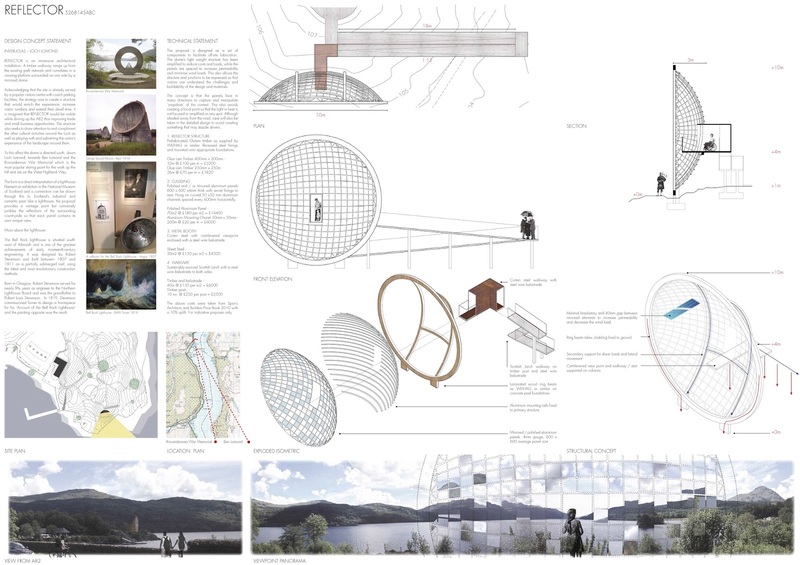 The first round of a competition run by the Glasgow Institute of Architects, this was an entry for Inverglas, a lock side site on top of a small hill with a great vista down Loch Lomond. The brief was to design a structure with a budget of £125 000 that would serve as a point of interest along a popular tourist route. REFLECTOR is an immersive architectural installation. 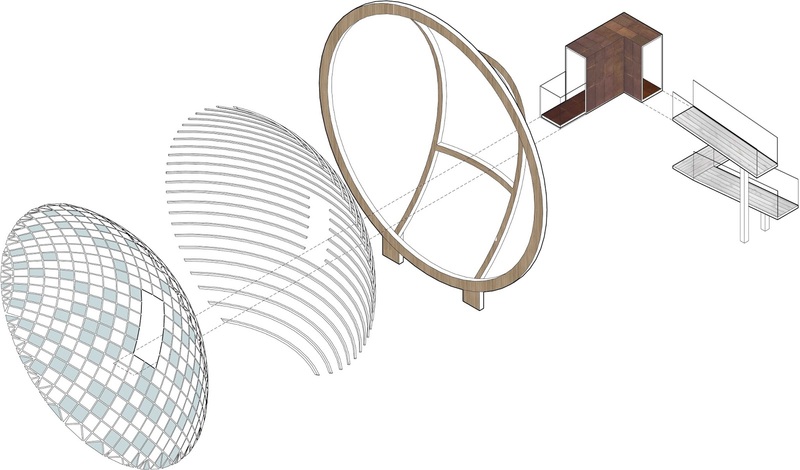 A timber walkway ramps up from the existing path network and cumulates in a viewing platform surrounded on one side by a mirrored dome. Acknowledging that the site is already served by a popular visitors centre with coach parking facilities, the strategy was to create a structure that would enrich the experience; increase visitor numbers and extend their dwell time. It is imagined that REFLECTOR would be visible while driving up the A82 thus improving trade and small business opportunities. The structure also seeks to draw attention to and compliment the other cultural activities around the Loch as well as playing with and subverting the visitor’s experience of the landscape around them. To this affect the dome is directed south, down Loch Lomond, towards Ben Lomond and the Rowardennan War Memorial which is the most popular staring point for the walk up the hill and sits on the West Highland Way. The form is a direct interpretation of a lighthouse filament on exhibition in the National Museum of Scotland and a connection can be drawn through this to Scotland’s industrial and romantic past. Like a lighthouse, the proposal provides a vantage point but conversely jumbles the reflections of the surrounding countryside so that each panel contains its own unique view.